MEETIC (FR0004063097 – MEET), the European leader in online dating, today announces its audited half-year results for the first six months of the year to 30th June 2008. As announced when half-year revenue was published, the Group recorded revenue of 63.0 million euros over the first half of the year, an increase of +18.4% on the first half of 2007, +20.7% at constant forex. Over the first six months of the year, the number of subscribers increased by 74,097 and reached 651,252 at 30th June 2008. The fall in ARPU (Average Revenue Per User) to 17.44 euros from 17.90 euros in the first half of 2007 reflects the intensive customer-winning strategy implemented over the half. The very positive evolution in the monthly churn rate, which stood at 13.7%, lays witness to the loyalty of our subscribers. In accordance with the Group’s strategy of gaining market share on its traditional business lines and in the main countries in which it is present, marketing investments over the first half of 2008 represented 37.8 million euros, or 60% of revenue, versus 28.4 million euros over the first half of last year. These marketing investments mainly concerned “dating” activity in France, Germany and the United Kingdom. In particular, these latter two countries, in which the Group has recently developed through the acquisition of DatingDirect and NEU.DE, are particularly strategic because of their substantial growth potential. Operating costs represented 16% of revenue on average, versus 14% in the first half of 2007. The workforce increased from 356 employees at 30th June 2007 to 411 employees at 30th June 2008. 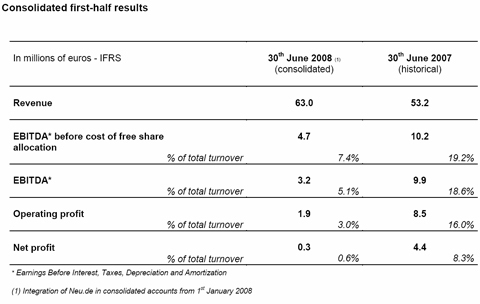 The ratio of personnel costs to revenue was 16.5% at 30th June 2008 (excluding the cost of free share allocation), versus 14% at 30th June 2007. These operating and personnel costs include the cost of developing the Content and Traffic line, which totalled 0.7 million euros at 30th June, giving a 1% impact on the operating margin. Net profit came to 0.3 million euros, and was significantly affected by a high effective tax rate. Corporate tax totalled 1.7 million euros, an effective tax rate of 83% compared to 43% at 30th June 2007. This sharp increase was due firstly to the tax paid by the MEETIC SA entity, which generated a profit whilst some rapidlydeveloping subsidiaries recorded a loss over the half, and secondly from the inclusion in accounts of a non-deductible 1.5 million euro charge associated with the free share allocation programmes. The Group continues to benefit from an economic model that generates positive operating cash flow thanks to the dominance of the subscription model in its activity. At the end of the first half of 2008, the Group had a cash position of 14.1 million euros after the acquisition of NEU.DE for 24.8 million euros cash. Launched in June in Germany and the United Kingdom in order to accelerate Meetic’s development in these strategic zones, and in July in France to support the deployment of Meetic Affinity, these advertising campaigns are already recording extremely positive initial results. In accordance with its market plan, in mid-July MEETIC put the VIOO.com site for women online. Currently still in its ‘beta’ version with the official launch planned for September, VIOO.com has received an enthusiastic welcome from specialist players. The site’s rich and diversified content works via an original principle that consists in making users contributors to the site’s editorial content. Supplementary advertising investments should total 15 million euros over full year 2008, towards the top end of the bracket announced in March. These campaigns aim to boost the development of ‘dating’ activity, in particular in the UK and Germany, as well as the deployment of Meetic Affinity in Europe. These supplementary investments also include the marginal operating costs of the new Content & Traffic line. You can find MEETIC’s full Half-Year Financial Report on the www.meetic-corp.com website, in the Publications section.